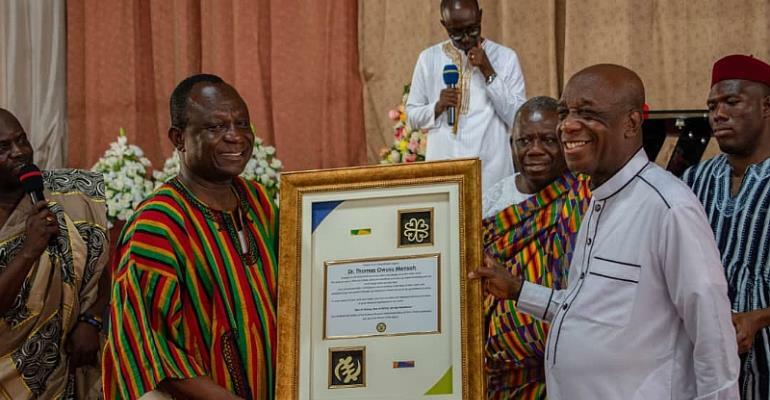 The Famous Technology Icon Dr. Thomas Mensah, inventor of Fiber Optics and Nanotechnology Expert was honored in Ghana at the Black Heritage Month celebrated at the Assemblies of God Church Adenta. He spoke under the theme: "Blacks Are Also Created in the Image of God and the Right Stuff Comes in Black Too." Dr. Thomas Mensah whose innovations in Fiber Optics supports social media and the modern day Broadband Internet, is the Author of the Book- The Right Stuff Comes in Black Too. His fourth book and Biography that focuses on innovation. Dr. Mensah told the audience that they are the Right Stuff, and Skin Color has nothing to do with intelligence as some previous scientists have sought to promote in the Bell Curve concept., that each individual can reach the heights of significant success and achievement if they work hard. He quoted Dr. Martin Luther King who said a person should be judged by the content of their Character not the color of their skin or race. He showed a Tee Shirt that Displayed The Right Stuff Comes in Black Too. The CEO of Tourism Mr Akwasi Agyemang also spoke on cultural diversity an important Asset to Ghana, as the church invited each member from the 16 Regions in Ghana to come up in front all wearing Ghanaian and African prints to represent all the regions in Ghana. Dr. Mensah was invited as a Guest speaker by Reverend Francis Nyarko Pastor of the church who happens to have Automotive Engineering Background. Dr. Mensah emphasized that Racism and Discrimination based on skin color or race is the source of most problems in our world today.